The BBC is reporting that the proposed landline duty – the 50p/month levy on fixed lines to contribute towards building out high-speed broadband services beyond where the market would deliver – has been dropped. The dropping of the proposal, on which a BIS consultation closed only last week, is not because the government is suddenly unconvinced of the need for the Next Generation Fund which the duty would have established; it has been dropped since the political controversy over it would potentially have held up the Finance Bill, which has to include the duty since it is a fiscal measure. This is one of a series of three measures – including also the rise in cider duty – which the government has dropped from the Finance Bill so as to ensure that it can complete its passage through Parliament before Parliament is dissolved later this week. Consequently, the landline duty is very much a victim of the election. Should Labour win the election, it is likely to be re-instated – the government’s policy has not changed – perhaps in a second Finance Bill after the election. However, it is disappointing that the landline duty has been dropped since the policy which lay behind it – that of extending high-speed broadband on a socio-economically equitable basis right across the nations and regions of the UK – was both sound in principle and, actually, far more important than the levy itself. Without the levy, and the Fund, the UK has no practical, resource-based response to the need to spread high-speed broadband equally across the UK other than where the market – i.e. the major network operators – decide where it can be done profitably. That is likely to lead to the over-provision of networks in large urban areas and the under-provision of networks in less populated, more rural areas and, in turn, to a widening of the digital divide. It is also likely to contribute to the further economic overheating of the large urban centres. For its part, the Tory policy on extending high-speed broadband beyond the market is ill-thought: based as it is on a reliance on the regulated opening up of BT’s ducts – a policy with which BT is happy to comply but which, as Ofcom has previously pointed out, is likely only ever to be a partial solution – backed by some money from the BBC licence fee otherwise earmarked for the digital switchover. The digital switchover is due to be complete by 2012 and the underspend in this budget is £200m, which Digital Britain had intended to use to meet its universal broadband service commitment by 2012. Any continuation of this budget beyond 2012 essentially takes money away from BBC programming – thus, for the Tories, killing two birds with one stone but which is likely to mean further cuts in the production of quality media content. The landline duty was fair in the context in which it was originally put by Digital Britain – that households had received a benefit from falling telecoms prices in recent years and that it was thus reasonable to ask them to share some of that benefit. The Connect Sector of Prospect had always argued that it was a moderate, affordable and specific contribution from consumers towards the cost of roll-out of NGA infrastructure beyond the market, and we also supported it as a welcome sign of the government’s commitment to a policy of ‘industrial activism’. 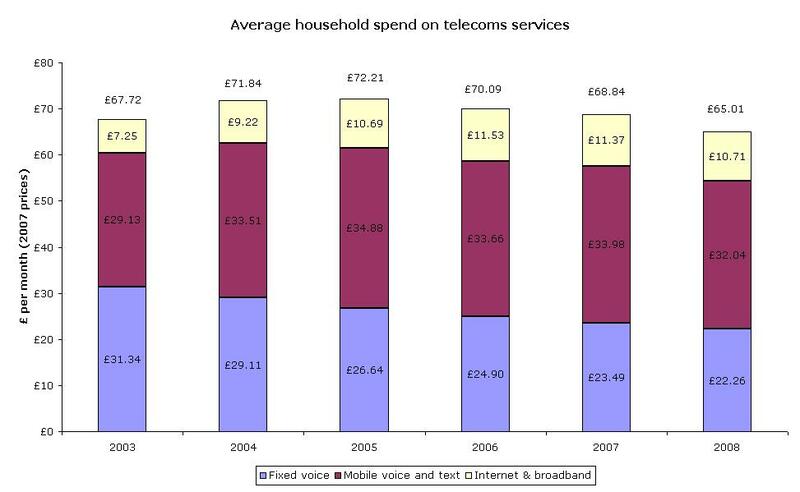 The chart shows clearly the falling nature of household telecoms bills, which declined from 3.4% of monthly expenditure in 2005 to 3.2% in 2008 – the same proportion as in 2003. If we focus on the decline in the amount of expenditure on fixed voice and on internet and broadband – i.e. the sums going to the operators charged with responsibility for rolling out high-speed broadband services – we can see that these have fallen by £5.68 per month – at standard prices – since 2003 (a drop of 14.7%). In this context, a 50p/month levy was, and remains, fair. This decline in return is not a rational basis on which to found an expectation that operators will roll out costly investment in fibre networks in areas where it is even partly speculative. They will, instead, concentrate only on the clearly most profitable areas. That will inhibit the roll out of fibre networks, putting the extension of fibre roll-out some twenty points lower than it otherwise would have been by 2017, and it will exacerbate the divides within the UK. That would be a disaster for the UK both socially and economically. lets hope they lose then…..
Thoughtful and well constructed piece. Thank you for taking the trouble.